Turn Lightning McQueen into an all-around racing champion! In Lightning`s Off-Road Training, Sarge will help improve your driving agility and control. In Endurance rounds, you must complete three laps quickly. In Exploration mode, you must find and collect the blue flags. 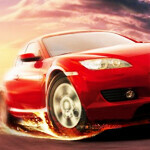 Dodge humongous obstacles on Precision tracks!Lightning`s Off-road Training is one of our selected Cars Games. Also very popular on this website right now are Wheely 7, Park My Car 2, Snail Bob 3 and Inside Out Thought Bubbles.